Note: this blog will return to Montana to finish out the end-of-summer posts after a brief detour to Chicago for the Rock and Roll Half Marathon. Sometimes hard work, dedication and perseverance are the keys to success. Other times, success just sneaks up on you, like a creepy guy in a dark alley. 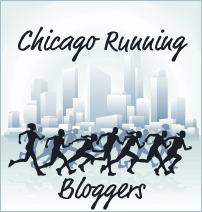 I hadn’t originally planned on doing the Chicago Rock and Roll Half-Marathon. When I was writing my Patch column on the race, I did some research and heard mixed reviews. While the event was touted as fun and well-organized, people also noted the course was crowded and had too many turns. Add to that the fact that August in Chicago can be brutally hot, and all chances for a fast time or Personal Record were sure to fly out the window. But my friend Ilyse was planning to do it and wanted me to do it with her. What’s more, my friend Lisa was going to do it too, and we rarely get to do races together. I knew it wouldn’t be a PR-kind-of-event, but I was going to be in town anyway, and it seemed like a fun race to do with friends. So I signed up. But Ilyse didn’t. Neither did Lisa. Alas, the race was ridiculously expensive (over $100! ), so I still had to do it, even if they weren’t. I paid my money, lots of it, so I was determined to be there – crowded course and oppressive heat be damned. Fortunately, I discovered that a bunch of those crazy Twitter runners were doing it, including my speedy friend Chanthana. One pal, Michael, was coming all the way from Alabama for it. And since I was going to be local, and had already signed up, I had no excuse. Confession: I didn’t train for this race. True, I’d been running all summer, but only casually. Not a single session of speed work. As a result, my pace had slowed to what should be considered a jog. I knew a PR was off the table to begin with, so I just planned to do it as a slow fun run. My only goal was to be faster than my time at the Buffalo Run Half Marathon three weeks earlier. In other words, as long as I didn’t take home a new Personal Worst, I’d be happy. The run started out humid and warm, but soon there was a slight drizzle and the air cooled. The temperature was perfect. Somehow I’d ended up in a speedy corral so I didn’t even have to weave around people. 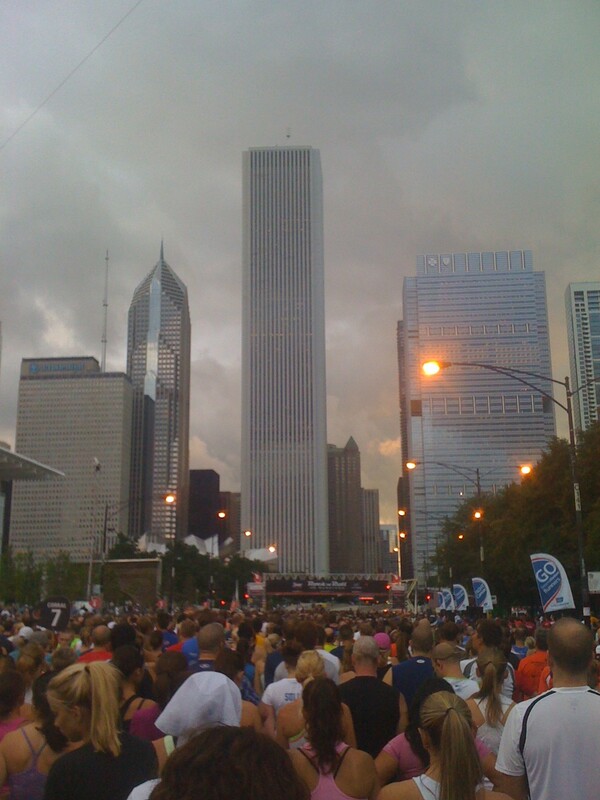 The course, redesigned for 2011, was entirely on the streets of Chicago (instead of the Lakefront Path) and was not particularly crowded. I had some nice pacers to run behind. I kept looking down at my watch thinking “I’m going too fast, there’s no way I can hang on to this.” And yet, every time I was about to fade, there was a refreshing sprinkle or a cool breeze or sometimes just a good song on the ipod. I kept going. At one point when I was starting to slow, I got passed by a woman running with a dog. A dog? Yes, a lovely German Shepherd. Now, I’ve been beaten by a dog before, and I wasn’t going to let it happen again. I mean, I have to draw the line somewhere, right? I’ve been beaten by jugglers, superheros, pumpkins, Santas, Ninjas, Thing 1 and Thing 2, and I was almost beaten by a banana and the Eiffel Tower. So what’s next, gerbils racing me to the finish? Kittens? Turtles? No, the madness had to stop. I had to catch that dog. I picked up my pace and pulled up alongside. I chatted with the owner who informed me the dog jumped in at mile 6. Ha! A bandit dog, and not even running the entire route. No shame getting beaten by him. He’s got fresh legs. Four of them, in fact. I let them go on their way, my pride still intact. As I headed for the finish, I realized I had managed to keep a faster-than-expected pace. Before I knew it, I crossed the line and had a shiny new PR. By how much? Well, that’s a good question. It was a full two minutes faster than last year’s Buffalo Run. But (shh) between you and me, I don’t think the Buffalo Run is quite 13.1 miles. My Garmin always puts it at 12.95. So, based on “official” Half Marathons in Athlinks, its a nine minute PR. Nine minutes! Which just goes to show: keep the expectations low, and you’ll always be pleasantly surprised. That’s my motto, and I’m sticking with it. The start line. Perfect cloudy running weather. Love this! I had a similar experience at Around the Bay in Hamilton in March. It shouldn’t have been a good race (I slept on the floor the night before, for goodness sake!) but it was my best ever. That’s one of the great things about running, eh? No matter how much we train and plan and anticipate things can gand do o terribly wrong sometimes. But then there are those magical days when everything goes right and it feels soooo amazing! Thanks for sharing your running adventures! The problem is we never know if that running magic is going to work or not. Well, I guess that’s part of the fun, eh? 1.I’m liking that motto. I think I will have to adopt it! 3. Wow! You certainly are getting around with your races. Congrats and keep up the good work. BTW, what will you be up to while in Montana? Well, I probably HAVE been beaten by a baby – in a jogging stroller! I’ll be sure to add that to the list. Thanks! Good advice about keep expectations low. As for me, I’d have been happy just to finish the race at all. My expectations are on the floor! Nice job.